I didn’t buy a car, but I did – HubNut – celebrating the average! April 6, 2011 April 20, 2014 HubNut Blog, Uncategorized Leave a comment 7409000buyBuyingGLTsaabvolvowhich one? I’ve been keeping my eye on the classifieds. Since I sold the BX last month, I’ve been struggling to decide what to replace it with. When it comes to mixing comfort, economy and eccentricity, there’s nothing to touch it. So I gave up trying to find its equal – for the time being. I decided that the new car had to be over 20 years old, to ensure I can insure it on my classic policy. This point was really driven home by a brief and crazy exploration of Alfa Romeo ownership – a 156 2.4JTD five-pot diesel looked ideal until I started getting insurance quotes that were almost as much as the purchase price of the car. Besides – old cars are better really aren’t they? More simple, easy to work on and a statement to the world that I haven’t been fooled by the so-called merits of a modern car. The downsides are that 20 years ago, diesels were still a relatively new thing for the mainstream market – the BX and its Citroen/Peugeot siblings really did lead the way. A Mk2 Cavalier diesel had to make do with 55bhp when launched for instance! Not ideal for the hills of Wales. So, I decided to ignore economy. Well, not ignore. The Scimitar reminds me that an outright fuel guzzler is not ideal. I lowered my standards and decided that anything capable of 30+mpg was worth a look. Amazingly, two very different cars leapt onto my radar at the same time. They were both right on the limit of my date cut-off, both had 2.3-litre engines, both hailed from Sweden and both were for sale in Wales. 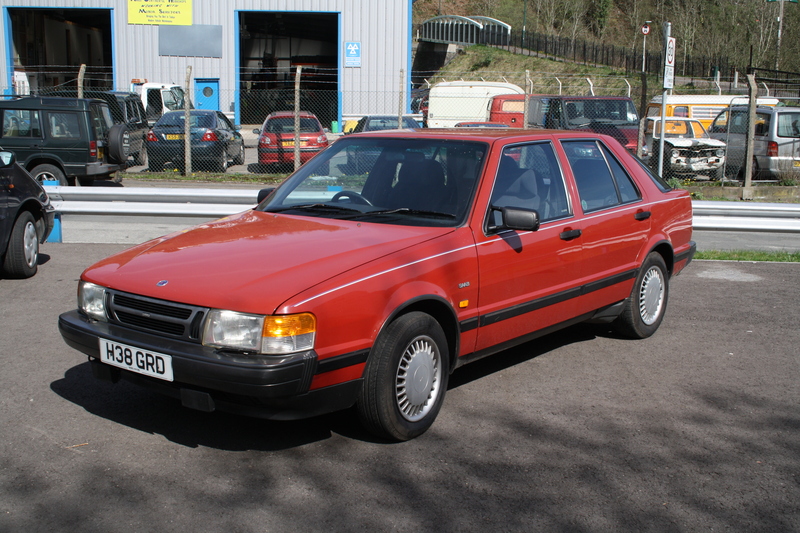 The first car was a Volvo 740GLT saloon, though of the later facelift shape which I’m not that keen on. Still, at £700 for a 144k mile saloon in stunning overall condition and with full service history, it was worth a look. It was nice to drive as well, feeling a bit like a grown up Cortina. It had that lithe, rear-wheel drive feel and went like stink – why did people feel the need for a turbocharger as well? Overdrive was an oddity for 1990 but would help with economy. Sadly, as with a previous 740 that I owned, it was let down my hideous interior plastic that created lots of rattles. It had the odd battlescar that detracted form the superb overall condition. It was in the running, but first, the competitor! The Saab was 75 miles away, but £105 cheaper. The sun was shining, so out in the 2CV I headed. This was even better in terms of condition. 188k miles, 1 owner from new and full main dealer service history. To drive, it felt much more modern than the square-rigged Volvo. It was tighter and felt more secure – with a tough, hardy interior that made not a squeak. Mix in better economy, a more composed ride and the practicality of a hatchback and you can see why I was soon handing over a deposit. What really struck me with this pair is just what you can get for your money. There really does seem little reason to buy anything more modern, or more expensive. Will these golden days last? I’m not sure. Really, cars from the early 1990s represent the last of the relatively-simple line. The more modern you get, the more you encounter unfathomable electronics, expensive part failures and proper, built in obsolescence. Why have a switch to operate the reverse lights when a nice expensive computer can make the decision? Why not fit a dual mass flywheel, which will go wrong and cost over a grand to replace? The future of bangernomics is certainly not assured. I shall enjoy it while I can!